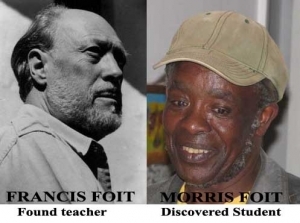 I was even more surprised when Foit told me that he was looking for his teachers family for over thirty years. He was at Czech Embassy in Nairobi, he asked art experts in USA, wrote letters but nothing worked. The only thing he got was a photo of his lost teacher from some American collector. His teacher was on research trip in Africa in 1948 when communists took over Czechoslovakia and he had to take refuge in Kenya until 1971. Living in Kenya with his wife he taught art at the University of Nairobi for more then 20 years. One day Francis (Czech Foit) went to market near Nairobi where he found a local village boy selling a small car made from clay. Francis liked it so much that he bought it and decided he would teach the boy to sculptor for free. As a teenage poor boy his carving skills greatly exceeded those of the students at the University of Nairobi. After the Czech Foit returned to Europe in 1971, the young African man went to work at military. After 14 years he remembered his teacher´s words:” one day your art skills will help you in your life”. He started to carve and brought his first art piece to world-known Gallery Watatu in Nairobi run by the legendary Ruth Schaffner. It was sold directly on the spot….and his new carrier started. After the unbelievable encounter on one sunny day in February 2008 with me I promised him to find the teacher´s family. Come back to AFRUM to learn what I have found!